Words Are Worlds, the debut release by Israeli vocalist Julia Feldman, is an inspired tribute to the work and personality of Billie Holiday. Feldman, augmented by pianist, composer and arranger Yitzhak Yedid and bassist Ora Boasson-Horev, interprets songs identified with Holiday, focusing on the lyrics, thus enabling herself and her trio partners to present a fresh and open-minded perspective to the Holiday legacy. Billy Holiday and Arthur Herzog's "God Bless The Child," the leitmotif of this release, opens the disc as a short and solemn prayer, part of a fifteen-minute suite that also includes a somber reading of Holiday and Mal Waldron's "Left Alone," with an arrangement that owes more to Paul Bley's impressionism than to Waldron's dark lyricism. The ensemble shines on Yedid's arrangement of Sammy Cahn's "I Should Care": Feldman's fragile, expressive vocal soars, Boasson-Horev alternates beautifully between arco and pizzicato, and Yedid's assured playing anchors this fine interplay. Feldman's original "I'm On Hold" is a temperamental song built on free improvisation by Boasson-Horev and Yedid. Feldman's trio's interpretation of Lewis Allen's "Strange Fruit" is almost reverential. Feldman accentuates this intriguing song with a minimal accompaniment by Yedid and Boasson-Horev. The linkage of Ornette Coleman's "Lonely Woman" to this tribute may be justified by the obvious image the standard projects, but this interpretation lacks the harmolodic flux and sounds too cerebral. The concluding version of "God Bless The Child" binds this impressive tribute with an innocent and soulful prayer, presenting the trio again in some of its most inspired interplay. The dreamy bonus track, "Coda," is a fine ending to this promising debut, which wisely retains the elegance and the idiosyncratic attitude that was so identified with Holiday. Visit Julia Feldman on the web. Track Listing: God Bless The Child/Untitled/Left Alone; I Should Care; I'm On Hold; Strange Fruit; Lonely Woman; God Bless The Child; Coda (Bonus Track). 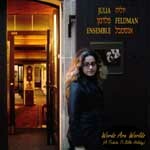 Personnel: Julia Feldman: Voice; Yitzhak Yedid: piano; Ora Boasson-Horev: bass.